We offer a wide category of Vest Type Grocery Bags that are used for shopping purpose. Customized as per the customer’s requirement, these are advantageous over conventional shopping bags in terms of strength, durability and good appearance. In stock we have bags available in many colours printing in any size and microns. 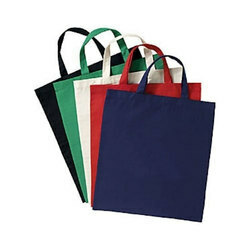 The T Shirts Bags are widely used for carrying grocery, medicines, vegetables and other items. These are demanded in shops, garment shops, Sweet & Bakery Shops, supermarkets, general stores and malls. The varied printed and unprinted bags are offered in various sizes, colours and GSM according to customized options to match the clients' demands.